This is... it is extremely sad for me to hear of this news. I feel as though stunned. Logged on to a friend's blogpage, and saw, on the sidebar the link to your page -- which included the title of this, your most recent posting. I clicked on it, hoping that I was mistaken -- then clicked from yours to the Vanity Fair statement. Having read everything I can get my hands on from this man, and watching him [online and on TV] in umpteen debates and interviews, and having JUST finished reading his memoir, Hitch22 -- it is with great sadness that I now lay my head down on the pillow to sleep. Christopher Hitchens is an integral part of the discussion of rationalism in our world today, and I feel that we sorely need him. This is a bad new / good news moment. I share your reactions about Mr. Hitchens, a man with a fiercely engaging intellect (though I fiercely disagree with his arguments against the existence of God); and I am quite encouraged about your good news (which helps confirm my arguments about the existence of God). Be well, my friend! How upsetting. 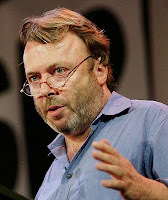 Although I agree with Hitchens's arguments, I'll nonetheless be praying for his well being. And yours.